Gain Experience Volunteering at an International Sporting Event! We have an exciting opportunity coming up in September, where you will have the chance to volunteer at the World University Squash Championships. 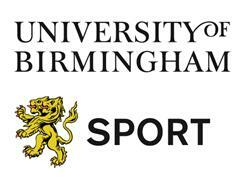 The competition will take place at the University of Birmingham, in Sport and Fitness from 2 - 13 September, 2018. Squash has been on the World University Championships sports programme since 1996, and it is a very popular sport among university students. Although not essential, as it is an international event, we are also looking for bilingual volunteers, so please get in touch and specify which languages you speak! Roy, who was a very well-known and highly respected member of Stourbridge, joined the Club some 40 years ago. Roy joined to play tennis and with his strong left arm and fast movement proved a very difficult player to beat in the tennis singles leagues and club tournament. Roy then turned to squash which became his foremost sport and in which he excelled. Roy played for Stourbridge for many years and ultimately, winning the National Veterans Singles Championship in his sixties. Later, Roy developed into a keen racketball player and regularly used the gym to enhance his mobility and strength. Sadly, whilst playing a racketball match on Monday last Roy collapsed on court. Roy was immediately and quickly treated by qualified staff, Jon Hope and Darren Bradbury, to whom huge thanks must go. Paramedics soon arrived, and Roy was taken to New Cross Hospital for further treatment. Very sadly, Roy did not recover and died at the hospital on Thursday evening last, 21st June. Our deepest condolences go to Roy’s wife, his immediate family, other relatives and friends on this saddest of all occasions. A service will be held at St. Marys Church, Oldswinford on Monday 9th July 2018 at 3:15pm then at Stourbridge Tennis Club afterwards. No flowers by request, any donations please will go to the Starlight & Chris Westwood Charity for Children, Via Wombourne Funeral Services ot the Charity box at Stourbridge Club. A grade will be run as a PSA Closed Sat running from Friday 16th - Sunday 18th. Prize money will be announced at a later date. B, C and D grades with run Saturday 17th - Sunday 18th. A, B and C are limited to 32 players, and D limited to 16 players. There will be plate events in each category. As it is Paddy's weekend we couldn't miss the opportunity to celebrate. Drinks offers will be running all weekend, with entertainment on the Saturday evening. Those who fancy it can venture off into town and really digest the wonderful Stourbridge nightlife. Food will be served throughout the Friday evening and all day Saturday. Saturday is also 6 Nations Finals Day! A day of Rugby alongside Squash is what dreams are made of, so if you're looking for a change from the squash, then pop up to the bar, grab a Guiness and Swing Lowwwwww. 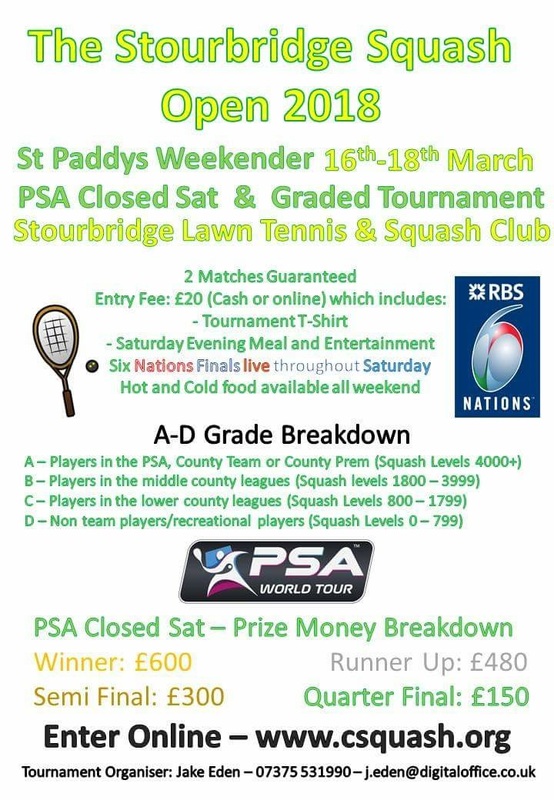 Entries will be made through csquash.org when we have the event up and running. Entry fee will be around £20, including a tournament t shirt. We are currently working with the entertainment to see whether there will be a slight cost or if it can be subsidised, so hold tight! Stourbridge now boasts a new Premier Inn. Unfortunately local lad Lenny Henry doesn't work there, but I'm going to have a word and see if there is a block booking we can do depending on interest. Otherwise there are plenty of other local gems dotted about. Stourbridge was the venue for the 2017 Worcestershire Racketball closed on Saturday 21st October. Competitors arrived from the length and breadth of the county to do battle in this one day event which guaranteed lots of competitive play. Players represented Boughton Park, Barnt Green, Energie Fitness Redditch, Redditch Rugby, Stourport and Stourbridge as well as clubs from outside the county such as Bridgnorth and Ardencote in this friendly and social day of Racketball. With the Ladies section decimated by injury it was down to the Men to lead the way in main event. There were some competitive early round quarter and semi final matches throughout the morning leaving just two standing for the late afternoon finale. This event has been played for since 2009 and has historically never been won by the same player more than once. That was all about to change as both Jason Russell and Matt Pugh were both previous winners. The final was keenly contested but in the end it was the fitter Russell who wore his opponent down to take the crown. This was another keenly contested event. Jason Russell was hoping to make it two wins on the day and reached the final with ease but his opponent would be the unseeded John Cartwright who had steadily made progress through the early rounds and pulled off a surprise in the semi. The final was tough and well supported but Russell was just too steady and came away with a 3-0 win but Cartwright will be happy with his performance on the day. This was a hotly contested league based tournament with each player having to battle it out 4 times over the day to secure victory. Last year’s Champion Spencer Cooper looked favourite and confident in the early encounters but in the early afternoon game he lost in straight sets to Bob Prew which left Andrew Smith in Pole Position going into their final game. In a seesaw encounter Cooper took it in the final set but Smith managed to secure a single set and that was all that he needed to head the group by a single point and become County Champion. New boy into the category Ian Hughes was too strong for his opponents in this one sided event. Comfortably winning his early round matches against David Allsop and Bernard O’Hara he would have more of a battle on his hands against the inform challenger and former o60 Champ Chris Hawken in the final. Hawken was clearly in form and had made steady progress through the event but despite fighting hard Hughes ran out 3-0. This was another keenly contested and sociable league based event that came down to the final game of the afternoon. A new Champion being crowned as Dee Cooper headed on to the scroll of honour beating previous Champion Val Molyneux 3-0.